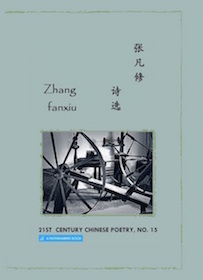 This book contains 30 poems by Zhang Fanxiu (张凡修）. Zhang Fanxiu was born in 1958 in Hebei Province, and has been a farmer since graduating from high school. In 2007, he moved to western Liaoning Province, and has since produced many poems that reveal a unique insight into nature, the land, and rural life. He has published three books of poetry: Writings from the Moors, The Spirit of the Earth, and Only the Earth. you will hear what happens in the eelgrass. Come to think of it, the fish and I breathe the same way. frantically sawing back and forth through the night. in his old black jacket. the scarecrow’s thick jacket comes off. where a bunch of bugs crawl out. by the time the grain ripens gracefully in the field. The scarecrow doesn’t know what is happening. But someone in a windbreaker comes and puts a windbreaker on him. turning red, and turning white. with speckles as thick as cricket droppings. stooping lower and lower with each step. standing in a hollow surrounded by hills. worn over loose pants with calf straps. Has dirt got into his shoes? I can’t see.